There are countless ways to share your service and achieve the Third Goal. Share the culture of your country of service on social media. The Paul D. Coverdell World Wise Schools Speakers Match program connects returned Peace Corps Volunteers to classrooms and community groups to share the Peace Corps experience. We will send you speaking opportunities in your area. 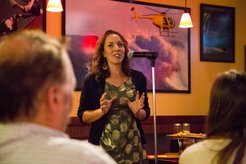 An RPCV shares a story from her service at a storytelling event in northern California. Use the activity design template [PDF] to plan your event. Give a talk tailored to any audience using this presentation template [PPT] and presentation tips [PDF]. Organize a Peace Corps International Festival [PDF] with tables from multiple countries. Learn to find, hone, and craft your story with this storytelling guide [PDF] or watch the storytelling training, then plan a story event [PDF]. Host a video chat [PDF] between a group in the U.S. and a group in your host country. Write blog stories about your experience using these blogging tips [PDF]. Create a video [PDF] to share your host culture with family and friends and then plan a film screening [PDF]. Looking for more images? The Peace Corps Media Library is a collection of photos submitted by the Peace Corps family searchable by country or keyword. Want to include a video? The Peace Corps’ official YouTube channel had fresh, creative, inspiring videos on what it's like to be a Peace Corps Volunteer. Select one to share as part of your talk. Peace Corps Fast Facts lists current statistics, facts, figures, and other pertinent information on Peace Corps today. But remember, the most interesting part of your talk will be your personal experiences. Log into the RPCV Portal to tell us when you share your experience and help demonstrate Peace Corps’ domestic. Receive emails with all the latest RPCV news.